Yee King Noodle on Sussex Street in Chinatown is, in professional culinary terms, totally freaking awesome. Yee King Noodle is your basic hole-in-the-wall joint with the mandatory condiment tray on each table including vine (sic) and Chinese dessert, aka toothpicks. And most importantly there is Chinese beer, made for eating. Only a few weeks ago we were in Hong Kong paying less that $2 per long neck for the same beer, sniff sniff, it tastes so much better overseas too, much fresher. The menu is amazing, normally in a restaurant we can pick just a handful of dishes that tickle our fancy, at Yee King Noodle we find around 25 dishes we are busting to try. We have been here a few times, see our other blog post here. This time we go for dry fried green beans with minced pork, lovely smokey flavours, giggles of pleasure. $12.80. It's a cold night so we try the northern style stewed pork with glass noodles. We were worried that this would be bland stodge but is was very tastey stodge, thumbs up. The pork was tender and the glass noodles soaked in the liquid was a master stroke. $15. Cold silken tofu with preserved (century) egg counters the other dishes perfectly. $8.80. We ordered too much and had to doggy bag it, it's a tough life eh? Yee King Noodles is at 408 Sussex St, Chinatown, opposite the Sussex Street Food court. Yee King Noodles has one of the most interesting menus in Chinatown, this is one of our faves, currently Mr Shawn's favourite Chinese joint in Sydney. 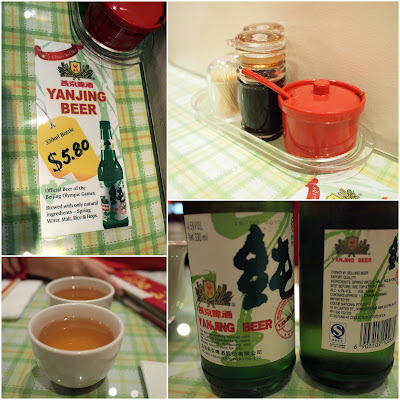 We have been to Yee King Noodles a few times, see our other blog posts here.